The discovery of this approximately 13.5 billion-year-old tiny star means more stars with very low mass and very low metal content are likely out there — perhaps even the universe’s very first stars. The star is unusual because unlike other stars with very low metal content, it is part of the Milky Way’s “thin disk” — the part of the galaxy in which the sun resides. And because this star is so old, researchers say it’s possible that our galactic neighborhood is at least 3 billion years older than previously thought. The findings are set to be published in The Astrophysical Journal. The universe’s first stars after the Big Bang would have consisted entirely of elements like hydrogen, helium, and small amounts of lithium. Those stars produced elements heavier than helium in their cores and seeded the universe with them when they exploded as supernovae. This star’s extremely low metallicity indicates that in a cosmic family tree, it could be as little as one generation removed from the Big Bang. 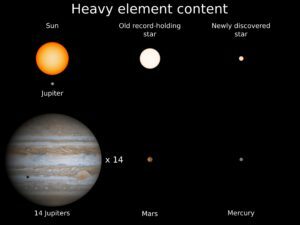 Indeed, it is the new record holder for the star with the smallest complement of heavy elements – it has about the same heavy element content as the planet Mercury. In contrast, our sun is thousands of generations down that line and has a heavy element content equal to 14 Jupiters. The star is part of a two-star system orbiting around a common point. The team found the tiny, almost invisibly faint “secondary” star after another group of astronomers discovered the much brighter “primary” star and measured its composition by studying a high-resolution optical spectrum of its light. The presence or absence of dark lines in a star’s spectrum can identify the elements it contains, such as carbon, oxygen, hydrogen, iron, and more. In this case, the star had extremely low metallicity. Those astronomers also identified unusual behavior in the star system that implied the presence of a neutron star or black hole. Schlaufman and his team found that to be incorrect, but in doing so they discovered the visible star’s much smaller companion. As recently as the late 1990s, researchers believed that only massive stars could have formed in the earliest stages of the universe — and they could never be observed because they burn through their fuel and die so quickly. This research is based upon observations using the Magellan Clay Telescope, Las Campanas Observatory and the Gemini Observatory.